We are each so much more than just an individual. We are an integral part of the soul of the universe. Zooming back in: we are also an integral part of the soul of our family. And in this culture, we generally have no idea how much that influences us. The stories of our ancestors, the generations that came before us – these stories live in us in a very real way. And they can either empower and enliven us, or we can live helpless to unconscious entanglements with their fate, sacrificing our own well being. 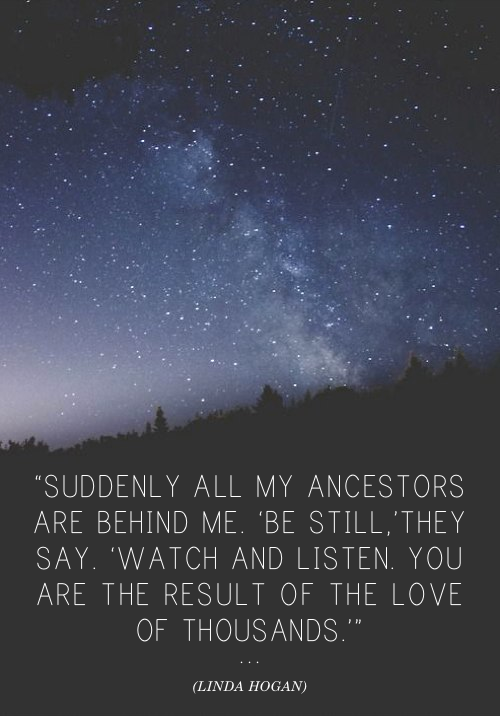 Constellation work is a wildly experiential means of discovering just how connected we are to our families, our ancestors, their stories, and each other. More than that, it can potentially shift patterns you’ve been struggling with for years, even if you never thought they had anything to do with your family. During this powerful day long workshop, we will bring to life the hidden dynamics of 3 or 4 participant’s families, and see what is ready to change and heal. This work is about trust. For those of you familiar with Constellations: we will work blind. That means the only person who knows who is representing who is the client. Not the facilitator, not the representatives. We step blindly into the process and trust the innate healing intelligence of the family field. Nothing is forced. Magic unfolds. If you’ve never seen this work before, feel free to get in touch for a conversation before you attend. Note for those of you who know me as an astrologer: This is not astrology! It’s a totally different kind of “Constellation”! Confusing, I know. Please click the button below to email Jackie with any questions and also to register.